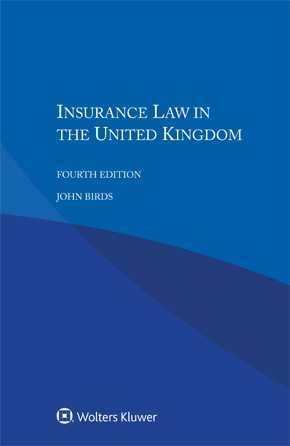 Derived from the renowned multi-volume International Encyclopaedia of Laws, this book provides valuable practical insight into both public supervisory legislation concerning insurance and private insurance contract law in the United Kingdom. An informative general introduction surveying the legal, political, financial, and commercial background and surroundings of insurance provides a sound foundation for the specific detail that follows. The book covers all essential aspects of the law and regulation governing insurance policies and instruments. Its detailed exposition includes examination of the form of the insurance company and its reserves and investments; the insurance contract; the legal aspects of the various branches of property and liability insurance; motor vehicle insurance schemes; life insurance, health insurance, and workmen’s compensation schemes; reinsurance, co-insurance, and pooling; taxation of insurance; and risk management and prevention. Succinct yet eminently practical, the book will be a valuable resource for lawyers handling cases affecting the United Kingdom. It will be of practical utility to those both in public service and private practice called on to develop and to apply the laws of insurance, and of special interest as a contribution to the much-needed harmonization of insurance law.